"Change can be so constant that you don't even feel the difference until there is one. It can be so slow that you don't know that your life is better or worse 'til it is. Or it can just blow you away... make you something different in an instant. It happened to me." Building a home and building a life both take patience and effort, and the more work put into the construction, the more rewarding the outcome. Both can weather over time due to exposure to harsh elements and willful neglect. Yet, when the core becomes exhausted and worn out, it is never too late to tear down the walls and rebuild. This type of blatant symbolism runs prevalent through Life as a House, a film that is maddeningly conventional, yet at the same time, a wonderful triumph of the human spirit. 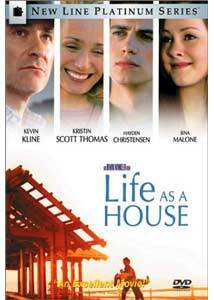 The life examined in the film is that of miserable and jaded George Monroe (Kevin Kline). Barely speaking to his ex-wife, Robin (Kristin Scott Thomas) or drug-addicted teenage son, Sam (Hayden Christensen), he resides in a dirty, brokendown shack built many years ago by his abusive, alcoholic father. His life turns from bad to worse when he is fired from his architectural job and diagnosed with inoperable cancer on the same day. Instead of playing the helpless victim, George decides to play the role of hero. He reacts to the shocking news with stimulated motivation to begin anew. He sets out to tear down his father's dilapidated house and build his own dream home, an obvious metaphor for putting his horrible past behind him and reconstructing a better life. In doing so, he becomes the catalyst for changing the lives of all he knows and loves, including his ex-wife and angst-ridden son. The script, written by Oscar�-nominated Mark Andrus (As Good as it Gets) is a mixed bag. Essentially, the story is a manipulative effort, doing whatever it takes to make certain there is not a dry eye in the house by the time the film reaches its predictable outcome. The countless analogies are not terribly subtle, nor are they intended to be, which often feels a bit heavy-handed. There are also many awkward moments that seem to exist simply for the sake of convenience or invoking an emotional response from the audience. A ludicrous subplot involving a pesky neighbor and the perfect location for George's hospital bed are several inanities that left me biting my tongue and struggling to get back into the heart of the story. For all of the film's flaws, there is a saving grace that charmingly elevates its from uninspired sap to truly heartfelt emotion. A dramatic tearjerker is only as good as its characters, and Life as a House introduces deeply rich characters, accurately scripted to have as many weaknesses as they do strengths. Their relationships flow with natural realism thanks to the dense writing, fantastic performances, and Irwin Winkler's keen direction. All of the performances are top-notch, but Kevin Kline and Hayden Christensen shine considerably. Kline's everyday man quality is put to terrific use, and Hayden Christensen depicts remarkable intuition as an actor. The relationship between this divided father and son is the film's greatest standout. The slow unfolding of their bond is a natural progression, one that does not simply change from drugs to hugs in the wink of an eye. Sam slowly comes to the startling realization that drugs have taken away a part of his soul; his transition to sobriety is smooth and genuine. The careful attention put into creating such credible characters allows the audience to relate to them, feel for them, and, ultimately, weep for them. This goes a long way in contributing to the success of the movie. With every passing moment, Life as a House had a way of luring me in. I found its forceful style somewhat distracting, yet the simple, pure message tugged at my emotional strings, and even left me a bit misty. While Life as a House is far from a masterwork, it certainly stands on a solid foundation. Image Transfer Review: With cinematographer Vilmos Zsigmond's approval, the original 2.35:1 aspect ratio has been altered to 2.10:1. While some might consider this a sacrilege, the image looks natural at 2.10:1, and I never noticed any important information sacrificed outside of the frame. The only noticeable downside to the picture is a soft characteristic in many scenes. Otherwise, this is a striking image with lifelike colors and deep blacks throughout. With the exception of minor shimmering and edge enhancement, very few transfer-related artifacts are apparent. Overall, this is a wonderful visual experience. Audio Transfer Review: This is where I was disappointed. The film features both Dolby Digital and DTS 5.1 tracks, and both seem excessively loud. Loud to the point of stridence, and loud to the point of annoyance. While some listeners might love the brash tonal quality of the many modern rock songs, I felt compelled to turn down the volume several times. The aggressive nature of this mix results in a disappointing lack of dynamics; dialogue sounds too up front and bass on the Dolby track often sounds boomy and unclean. On the plus side, the surround speakers are aggressively utilized, especially with the sound of crashing waves from the Pacific Ocean. While the realistic placement of sound effects is wonderful, I cannot come to appreciate the over-the-top nature in which this soundtrack has been mixed. Extras Review: New Line has not exactly packed the house with extra guests, but there are ample, interesting special features to tide one over for a while. Adding to my approval, all of them are tastefully presented in anamorphic widescreen. First is the feature-length commentary by producer/director Irwin Winkler, producer Rob Cowan, and writer Mark Andrus. Working with the actors, the progression of the story, and the film's metaphors are among the many topics covered. While certain comments are sappy, I am quite appreciative of how candidly the art of filmmaking is discussed. Fans of feature-length commentaries will certainly enjoy this informative track, although casual listeners might not find it interesting. The first of two documentaries is Character Building: Inside Life as a House. This is more admirable than many documentaries I have seen, as the usually boring interviews are combined with interesting behind-the-scenes clips. Also particularly noteworthy is the fact that the scenes from the film are presented in the original 2.35:1 aspect ratio. This is an enjoyable and informative piece, despite its lengthy running time. The next extra, listed as a documentary, is actually a short featurette titled From the Ground Up. This section is dedicated to the creation of the fictional house and neighborhood, which were carefully constructed on the cliffs of beautiful Palos Verdes, California. This enjoyable piece is an insightful treat that shows how much work goes into the tiniest details of planning a major motion picture. In the deleted scenes section are four brief scenes with optional commentary from Irwin Winkler and Rob Cowan, who discuss their appropriate decision to cut each scene. Two of these scenes are an out of the ordinary look at the same scene shot two different ways, one of which uses a different actor in the role eventually played by Scott Bakula. The theatrical trailer is presented in anamorphic 1.85:1 widescreen along with soaring 5.1 audio, a method in which I believe all trailers should be presented. This two-minute trailer effectively sums up the story, yet elusively shies away from showing the true dramatic nature of the film. Rounding out the special features is a Theatrical Press Kit. Included are extensive production notes as well as cast and crew profiles. Though every aspect of this DVD has significant flaws, the positive attributes are more than enough to warrant my approval. Anyone who enjoys inspiring melodrama will no doubt connect with the touching message of the film, and fans of special features will likely enjoy the extra goodies. Life as a House comes highly recommended, if only for a rental.